As an ideal video editing tool, iMovie,FCE is widely used by video professionals and hobbyists. Since iMovie (including iMovie 11) only accepts MPEG-2, AVCHD, DV-Standard, HDV (High Definition Video), QuickTime Movie and MEPG-4 formats, you only need to rip and convert DVD movies to iMovie compatible videos on your Mac computer. Are you looking for any way that which program can adopt to import DVD movies to iMovie or FCE to complete some video editings? Are you annoying that your can not put your DVD Collections to your iMovie or FCE for editing? Here is the step-by-step guide on how to rip and convert DVD to iMovie videos on Mac OS X with Pavtube DVDAID for Mac. This Mac DVDAID to iMovie converter app can help you change DVD into a different format (like MOV, M4V, MPEG-4 etc) with least quality loss. By converting, you could then be able to import converted DVD movies to iMovie/FCE for trouble-free editing. Pavtube DVDAID has helped thousands of customers to backup or rip them DVD disc, folder, IFO and ISO image files. Since their business launch, their software has been designed and built to be both comprehensive and simplified in nature. It integrates DVD backup and DVD transcoding features to help users simply choose the best video presets according to their own terminal requirements in one go. DVDAID for Mac offers a divine method to remove any DVD copy protections and region code, and rip DVD to hard drive with ease. All popular video formats can be converted from DVD, including MP4, MOV, MPEG, AVI, WMV, MKV, FLV, M4V etc. You can use the DVDAID on Intel-based Mac OS X, the new Mavericks is supported. Step 1. 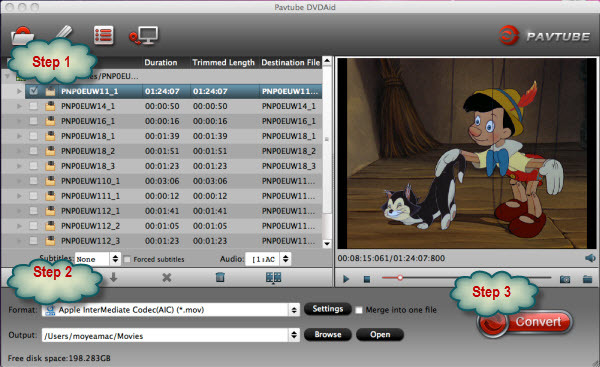 Download and install this Pavtube DVDAID for Mac, launch it and click Load Disc button to load DVD discs. Step 2. 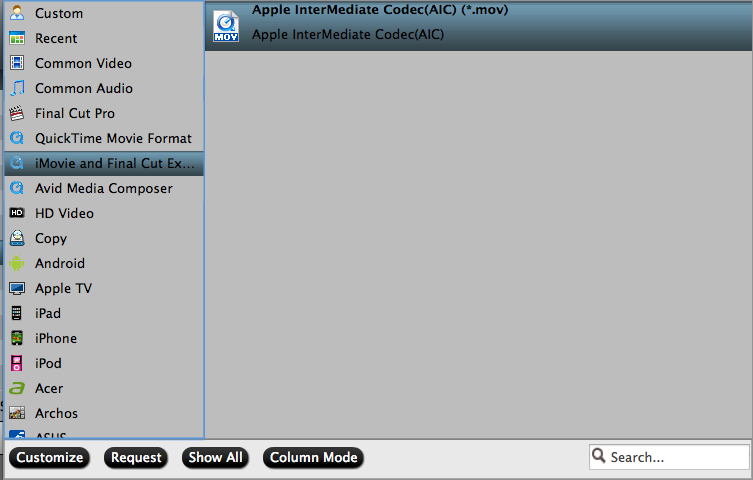 Click on “Format” bar and choose “iMovie and Final Cut Express” > “Apple InterMediate Codec (AIC) (*.mov)”. Step 3. Click on “Convert” button to start converting DVD to Apple Intermediate Codec. How to trim/clip specific length? Select the movie and click on “Edit”menu to enter Editor, where you clip out movie by setting the start and end points for each segment. 1) If you are a FCP X user, before you try to do the conversion, don’t forget to make sure that you have installed the Apple ProRes Codec manually since the FCP X asks users to install it by themselves. If you want to edit Blu-ray videos in Final Cut Pro (FCP), you just need to choose the “iMovie and Final Cut Express -> Apple InterMediate Codec (AIC) (*.mov)” in the second step. This tool also lets you convert DVD to ProRes MOV for FCP on Mac. In fact they are different tool but with the same ways. You can just download it and have a try! How to get DVD to edit in FCP, FCP X, FCE on Mac?